You need to upgrade your Flash Player Please upgrade to Adobe Flash Player 9. download the latest Flash Player if you wish. For unfailingly secure protection and storage, for quality packaging that is artfully beautiful, feels significant in your hand, looks great on a bookcase shelf, choose the package that people want to own - the package that reflects the value of the content. Choose SteelBook™. SteelBook™ has a metal exterior and a plastic inner core. Movies, television productions, music, games, audio books or software. Looking for strong shelf appeal? No problem. Artwork on metal creates rich-looking, dramatic results. Emboss or add varnish effects to increase the unique impact of your package. No paper required - a turn-key self-merchandiser. SteelBook™ appeals to consumers because it fits neatly on a shelf as an attractive, convenient addition to their home media library. 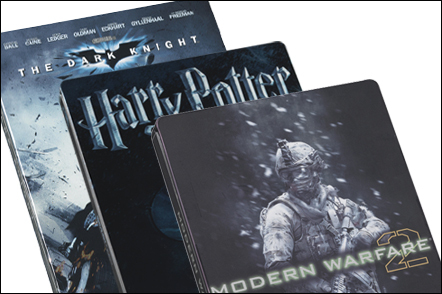 Packaged in a SteelBook™ case, your product will become a valued keepsake and reflect well on your brand long after the shrinkwrap is removed. Developed and manufactured by Glud & Marstrand A/S. Visit SteelBook.com for more informationor contact a media storage expert now!